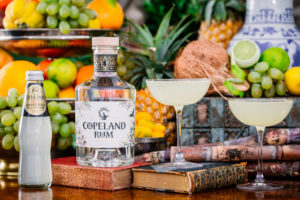 Copeland Rum shines in classic premium cocktails such as the original lime daiquiri where its character is highlighted and emphasised. Its bold flavour stands out, but it’s a friend to almost all mixers and adds character and value to the drinks it’s used in rather than getting lost in the mix. Unlike the ubiquitous G&T , rum doesn’t just have one sidekick or BFF. It’s a more versatile spirit that prefers to travel with an entourage and mingle with many. Having said that, the natural sweetness of the rum should always be counterbalanced with some form of acidity and for that there is no better ingredient for the job than rum’s ever present personal assistant, fresh lime juice. So for an off-the-shelf, simple serve try Copeland Rum with FITCH & LEEDES Ginger Ale, serve with a squeeze of lime.